What do you do when the wine you want to write about was somewhat underwhelming? You write about the food that you had with it because it was amazing…and mention the wine later. It is tomato season, guys. How do I know? Because our awesome landlady brings us bags of tomatoes every other day!! I love putting them on my sandwiches or make a tomato salsa but we still have tons. So, Nina remembered a recipe that my brother was taught by one of his friends’ grandmother who lives on the Romanian border in Greece (I swear, I did not make this up!). It is incredibly simple, but you must, must, must have tomatoes that actually are fully ripe and taste like tomatoes, so usually not the supermarket stuff…Give this recipe a try if you love tomatoes. It will not let you down! And it stores well in the fridge, too, so make as much as you can. 1) Get your grinder out and grind the tomatoes (skin and all) into a bowl. Yes, I mean grinding, as in cheese grinding. 2) Fill a pot with a very generous amount of good olive oil. You think you put in enough? Put in more! You want the onions and the garlic swimming in oil! Heat to medium heat and throw in onions and garlic. Let cook for 10-15 minutes. The onions and garlic should not brown if you put in enough oil, they will just become soft. 3) Pour in the tomatoes, bring to a simmer. At that stage, the ground tomatoes are quite liquidy. No worries. 4) Let simmer for 1 1/2-3 hours, until the sauce is not watery any more (varies with the amount of tomatoes). The texture depends on your idea of sauce. Season with salt and pepper, throw in as many fresh basil leaves as you want. 5) Done. 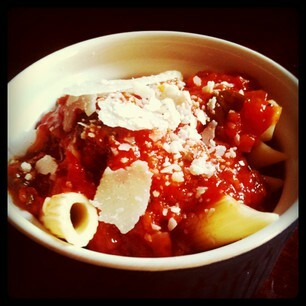 Serve with penne rigate or rigatoni and fresh parmiggiano. It is divine. 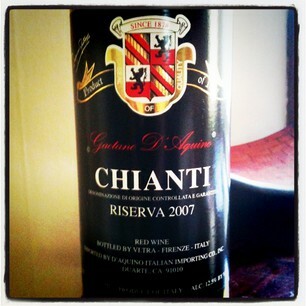 The wine we had with it was a 2007 Gaetano d’Aquino Chianti Riserva I picked up at Trader Joe’s a while back. I think chianti pairs well with tomato-based sauces, so I opened it up. The color was light red, slightly browned with some viscosity. On the nose there were prunes, sweet cherries. Nina got paint thinner, I did not detect that. But the wine smelled a bit fusty. The taste was rather sour, with some marzipane (sweet almond paste). It had nice tannins but was rather thin. The finish was longer than expected, but the sour notes dominated. It was not a bad wine, but it was also not a good wine. Of a riserva, I do expect a bit more. However, I thought it paired alright with our dish. Nothing special but paired alright with the food. That is a really good tip! I sometimes end up just adding some sugar if I find too much acid in the sauce, but this surely is a better alternative…thanks for sharing! I don’t remember ever having a Chianti that was rather acid though. Sounds a little bit odd to me. Usually I find the Chianti to be a dry on the palate with fruity notes, mellow, pleasing tannins and a long finish. But of course that could change from vintner to vintner.. Reminds me of a simple, unfussy, fresh tomato sauce (entirely uncooked) that we used to make frequently and haven’t thought of for the past few years. But will definitely be making it soon, maybe this weekend. Since you are lucky enough to have a landlady who shares the harvest, I thought you might be interested. Freeze a large wedge (not a skinny one) of brie for a couple of hours. Then slice off the rind and quickly grate the brie (the part that would be too runny to grate if unfrozen) into a large bowl. Finely chop 4-5 large tomatoes and about 1/3 cup of pitted kalamata olives. Add some chopped basil, cover and leave to meld for 3 or 4 hours, stirring occasionally. Then cook up a pot of pasta, drain very quickly, leaving some of the water still clinging to the pasta and toss all together. Are you reading any wine blogs in German? Or any good blogs in German at all? I haven’t been able to find any (probably because I don’t know how/where to search for them). I also, of course, will be trying out your Greek-style ragu. Ha, thanks for giving it a go. I am in the process of making the next batch, but so far I am underwhelmed. Somehow, these tomatoes seem to have had more acidity. We’ll see where we’ll be in a few hours. I am not sure I will be trying your recipe. I usually avoid attesting to it, but I am not a particular fan of soft cheeses (there, I said it!). I think honesty is always best. I mean, what if I ended up in Ann Arbor and we invited you to my special person’s place for dinner and you hadn’t told me you don’t like Brie and I served it? It would be a ghastly thing to happen. Thanks for the link.